Frederick, MD – The Tourism Council of Frederick County celebrated its 40th anniversary on Tuesday, November 1 with its annual meeting and dinner on the stage of the Weinberg Center for the Arts. 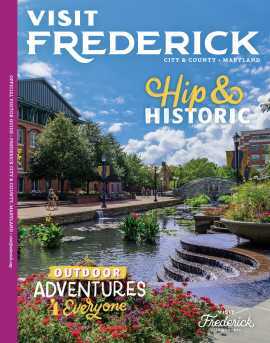 The evening’s program took a look back at how far Frederick has come over the last 40 years, reflecting particularly on progress made in Downtown Frederick since the 1976 flood. As a destination, the entire county has gone from a short day trip to a place that visitors want to spend multiple days and nights. Hotel Revenue in Frederick County reached a milestone in 2016, bringing in $50,000,000. This year’s Tourism Ambassador of the Year was awarded to the St. Angelo family, of Springfield Manor. This award is given annually to a group or individual who significantly enhances a visitor’s experience in Frederick County and contributes to the mission of the Tourism Council. Robert Black of Catoctin Mountain Orchard was also recognized for consistently distributing more visitor guides than any other member location. The following Tourism Council of Frederick County board members became effective during the annual meeting for a two year term, ending October 2018.